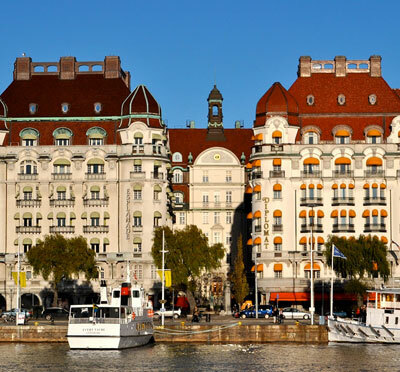 Östermalm offers some of Stockholm's most prominent places for conferences, arbitrations, trainings, kick-offs and other forms of events. The district consists mainly of beautiful, well-kept buildings, built before or around 1900. 7A is located at Strandvägen, near Nybroviken This magnificent venue offers fantastic conference rooms, most with seaview - a truly representative and professional environment. If you are visiting a 7A Strandvägen conference for multiple days, Hotel Diplomat is a great complement to accommodation. Diplomat is "wall to wall" with 7A and the hotel's high standard and character makes the facility match well. On Storgatan, one hundred meters from Östermalmstorg, is the "House of Business" - Näringslivets Hus - a multifaceted conference facility that fits everything from board meetings to educational programs and major conferences. Conferencing at any of the facilities near Stureplan is a nice accommodation option Hotel Riddargatan. The hotel also has conference rooms for smaller groups. At Karlavägen 100 is the Garnisonen Conference. The facility is a minute's walk from Djurgårdsbron, which is the perfect location for a strengthening lunch walk on the island Djurgården. In Djurgården, more specifically at Skansen, Skansen Restaurants offers a classic setting in beautiful premises at Solliden and Högloftet. Advice and recommendations and central booking service for conference at Östermalm and Djurgården, please contact our booking team!